On Sunday, January 26th, we posted an image to Facebook. It was a simple flaming chalice on a patterned background that asked Unitarian Universalists who saw it to share it. 15,000 of you did. It then asked anyone who saw it shared, and did not know what Unitarian Universalism is, to click on a comment in the original thread. That part did not work well at all, but it did some amazing things that we hadn’t really expected. The idea was to show Unitarian Universalists what kind of difference we could make by making sure that our friends and family knew more about our religion. 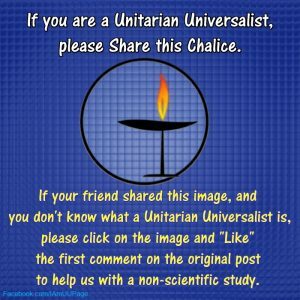 The intent was to see this shared a few hundred times (which seemed a little unrealistic at the time it was published), and show those who shared it that they had friends who didn’t feel like they knew what Unitarian Universalism was, or what we stand for. Because of the way Facebook handles comments, and is always trying to guess what you want to see, we don’t really know how many people intended to click where we wanted. In the end, Facebook tells us that over 56 thousand people saw this picture. Only 128 people clicked “Like” in the place we intended, but plenty of people also made comments about their ignorance or their opinion of Unitarian Universalism. We were all advised to repent by a couple of people, and one gentleman was offended by the idea that we were legally recognized as a religion. In all, there were over 100 comments made, though some are no longer visible to the public. This image clearly reached a lot of people, and it had many of them thinking about Unitarian Universalism for a minute. The really surprising result, though, was that at least 3 people clicked on the image, read through the comments, and told us that they had decided to reach out to their local congregation and explore Unitarian Universalism further. That is such a blessing and a victory for the staff of I Am UU. We know that we helped people find reasons to seek spiritual growth with the help of a UU community. Whether they ever “sign the book” or call themselves Unitarian Universalists, we know that we made a difference, and we gave local congregations a chance to connect with these people and make them welcome. That is the major part of what we hope to do here.